After AzhwAr, with tears in his eyes, withdrew from parOpadhESam (instructing others) by telling emperumAn “nedumAlE ninnadiyai yArOdhavallAr avar” some devotees of rudhra asked him “It is alright that you are praising bhagavAn’s greatness. But rudhra should be considered on a par with vishNu. During the time of amruthamadhanam (churning of ocean for nectar) was it not Siva who swallowed the AlahAla poison which would, otherwise, have killed the dhEvas, thus protecting them?” AzhwAr responds in this pAsuram saying “would you consider as protector someone like Siva who, after having solemnly vowed to bANAsura when he approached Siva to protect him, ran away from the battlefield when war broke out with krishNa?” and brings clarity in them. anangavEL thAdhaikku avar ivar enRillai evarum edhirillai kaNdIr – Have you seen that there is none, among both the knowledgeable and the ignorant without any distinction, who can be called as comparable to sarvESvaran who is praised as sAkshAth manmatha manmatha: (he is the most beautiful among all the beautiful persons) and who is the father of manmatha who is considered as the most beautiful? anagavEL thAdhaikku evarum edhirillai – just as there is none comparable to emperumAn in beauty, have you noticed that there is none comparable to him in maniliness too? avar ivar – the terms avar and ivar are normally used to refer to someone who is at a distance and who is closeby, respectively. Here, the term avar refers to brahmA, rudhra et al who are at a great distance compared to the ordinary chEthanas (sentient entities) in terms of knowledge and ivar refers to normal chEthanas. The meaning implied is that just as the normal chEthanas cannot be compared to emperumAn in terms of gyAna, Sakthi etc (knowledge, ability etc), in the same way brahmA, rudhra et al who have abundance of these qualities cannot be compared to emperumAn. 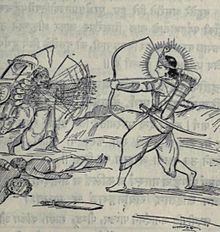 evarum edhirillai kaNdIr – rudhra, who you consider to be superior, as well as other deities who are under him, cannot match emperumAn, have you seen this? The implied opinion here is that in case they have not seen, they can see, even as AzhwAr shows them. When they (the devotees of Siva) ask him “How can you say that there is none? During the churning of ocean for extracting nectar, Siva had consumed the AlahAla poison and thus protected the dhEvas; wouldn’t he be comparable?” AzhwAr mercifully explains further . . . .
uvarikkadal nanjam uNdAn – SAsthras say that it was because of emperumAn’s significant presence at that time (as antharyAmi of Siva), that Siva was able to consume that poison. udan ninRu – standing together with bANAsura and engaging in battle against emperumAn. udan ninRu thORRAn – Siva lost the war, in the presence of bANAsura as the witness. orungu thORRAn – he lost without any distinction between himself and bANAsura. Just as mentioned by thirumazhisai AzhwAr himself in thiruchchandha viruththam 53 “mOdiyOdu ilachchaiyAya sAbameydhi mukkaNAn kUdu sEnai makkaLOdu koNdu maNdi venjamaththu Oda” (rudhra ,who had a curse which wil make him feel ashamed, along with kALi (dhurgA), his children and the huge army, ran away from the battlefield) and in pAsuram 71 of thiruchchandha viruththam “muNdan nIRan makkaL veppumOdi angi Odida” (mundan nIRan – Siva; veppu – fever; mOdi – kALi; angi – agni (deity for fire); all these deities ran away from the battlefield) and as mentioned by nammAzhwAr in thiruvAimozhi 3-10-4 “parivinRi vANanaikkAththumenRu anRu padiyodum vandherindha thiripuram seRRavanum maganum pinnum angiyum pOr tholaiya ” (putting Siva, who had burnt the three towns and who had taken a vow that he would protect bANAsura without any effort, along with his son ARumugan (skandha), and agni to shame in the battlefiled), Siva lost in the battle with emperumAn, along with his family members. This entry was posted in iyaRpA, nAnmugan thiruvandhAdhi on August 14, 2018 by T N Krishnan.